Reports of a mandarin duck spotted at Dawson Creek in nearby Hillsboro, Oregon, recently piqued my curiosity. Mandarin ducks are not native to the region, so that would make this little female either an escapee or a very lost duck indeed (technically, this makes her a “vagrant species” in the area). In either case, she isn’t something you see every day around here…and even if you see her, it’s entirely possible to not know you are looking right at something unusual! 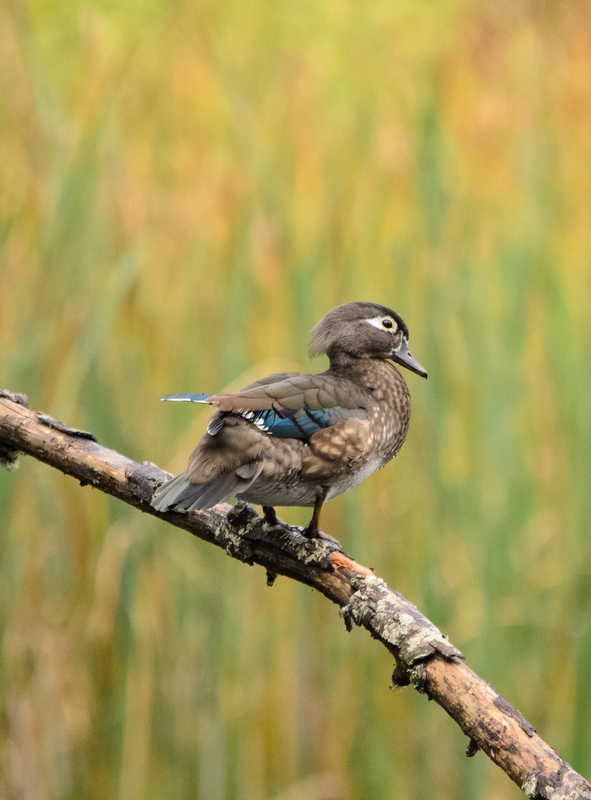 You see, the female mandarin looks incredibly similar to the female wood duck…and this girl has been hanging out right in a favorite wood duck haunt. 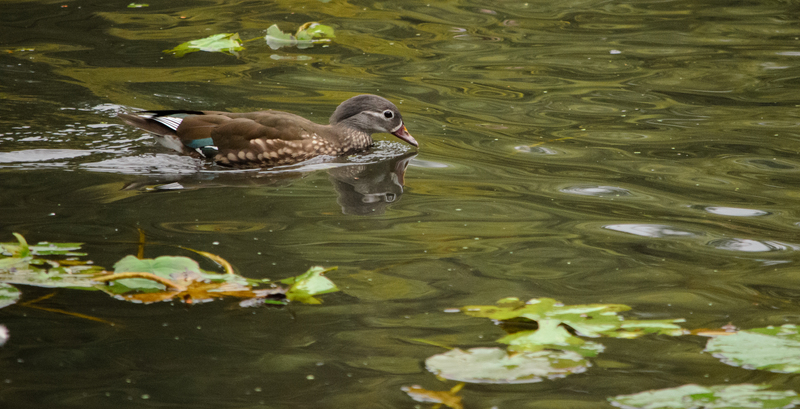 There are several ponds in the park, but it was not hard to figure out which one the wood ducks liked best. 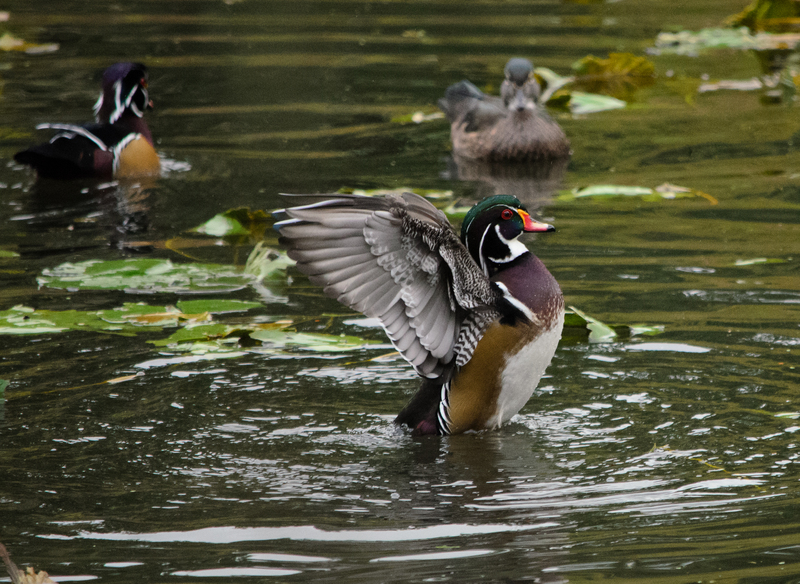 From my experience, wood ducks are typically shy and will quietly move away at a human’s noted approach, sticking to reeds and grasses to keep out of sight. Not so at this pond! Sure, they kept well back from any people, but this flock was clearly comfortable and highly active. 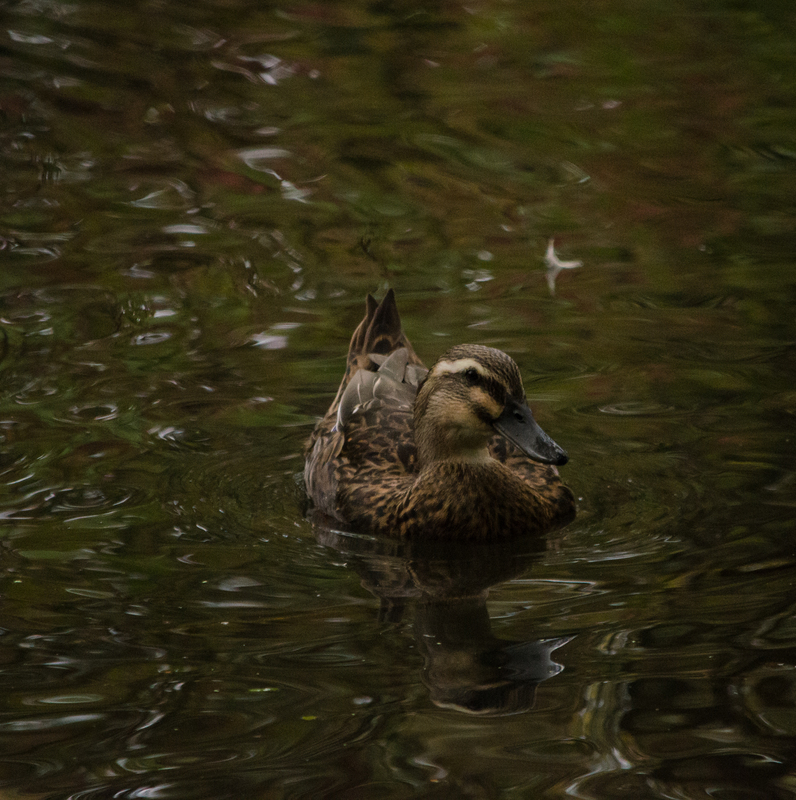 It was certainly quite the challenge to try and scan the entire pond for a single duck who happened to look nearly identical to dozens of others…but as you may have figured out by now, I was indeed lucky enough to pick her out of the crowd. There are a few defining characteristics that made her easy to tell apart once I knew what I was looking for. On the female wood duck, the eye is surrounded by a clearly defined white teardrop with a less distinct white eyeline going towards the back of the head; her bill is dark, and her overall coloring is brown with some blue and purple iridescence on her wings, as well as a less distinct green sheen on the brown wing feathers in good light. On the female mandarin, the white eye ring is much smaller and less distinct, with a very defined white eyeline going towards the back of the head; her bill is dark but definitely orange, particularly above the nostril. 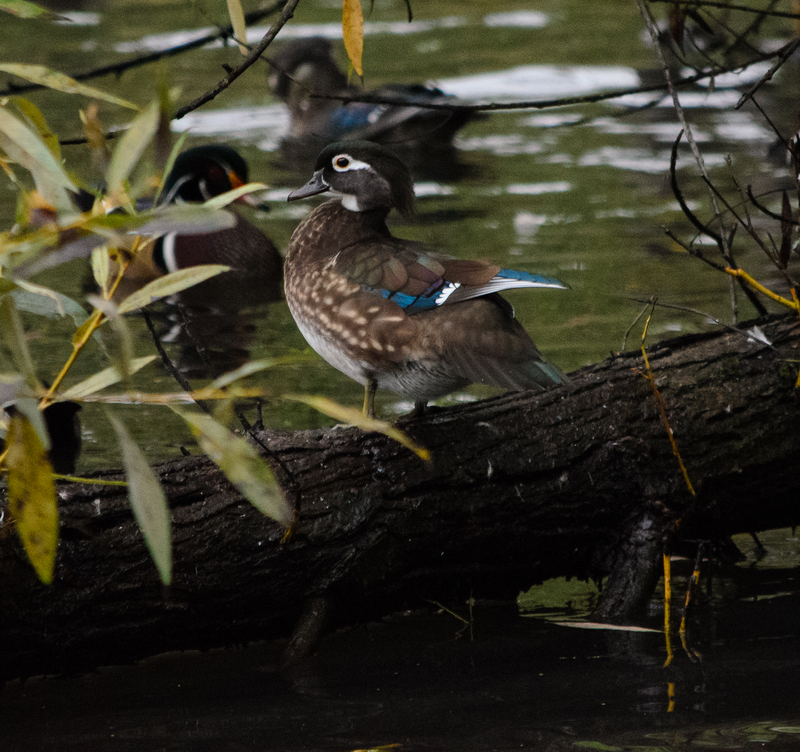 She lacks the blue & purple iridescence of the wood duck, and instead has a much more subtle green iridescent patch but not the sheen to her brown feathers. Both females have a pattern of light tan or buff spots on their overall brown chest and sides, but on the mandarin these spots are larger and more clearly defined. 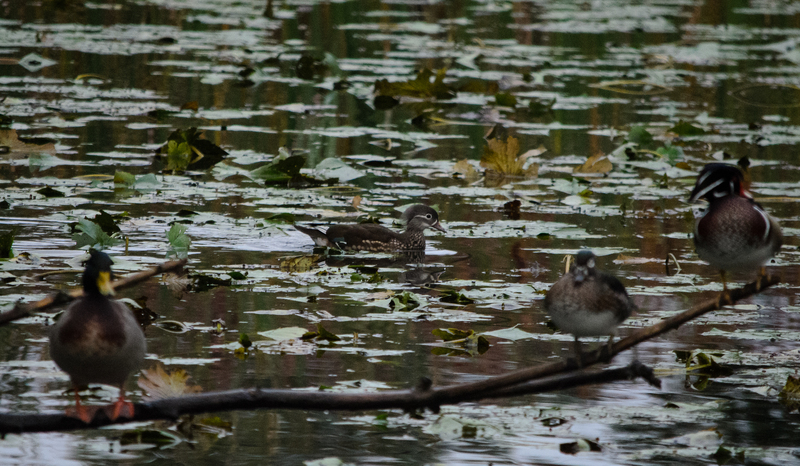 And finally, the female mandarin is more grayish in coloring than the female wood duck; however, with so many grayish juvenile wood ducks on the pond, this was hard to pick out initially. In addition to the million or so wood ducks I captured, this trip to Dawson Creek was fairly fruitful for a birding excursion. I also spotted American kestrel, European starlings, American robin, song sparrow, golden crowned sparrow, mallard ducks, American wigeon, Brewer’s blackbird, red winged blackbird, Northern shoveler, great blue heron, Western scrub jay, Stellar’s jay, Canada geese, a variety of domesticated ducks mixed in with the wild visitors, and last but not least, I picked up #103 for my list: the acorn woodpecker. (The mandarin came in at #104.) Whew! This is a location I will be sure to visit again. 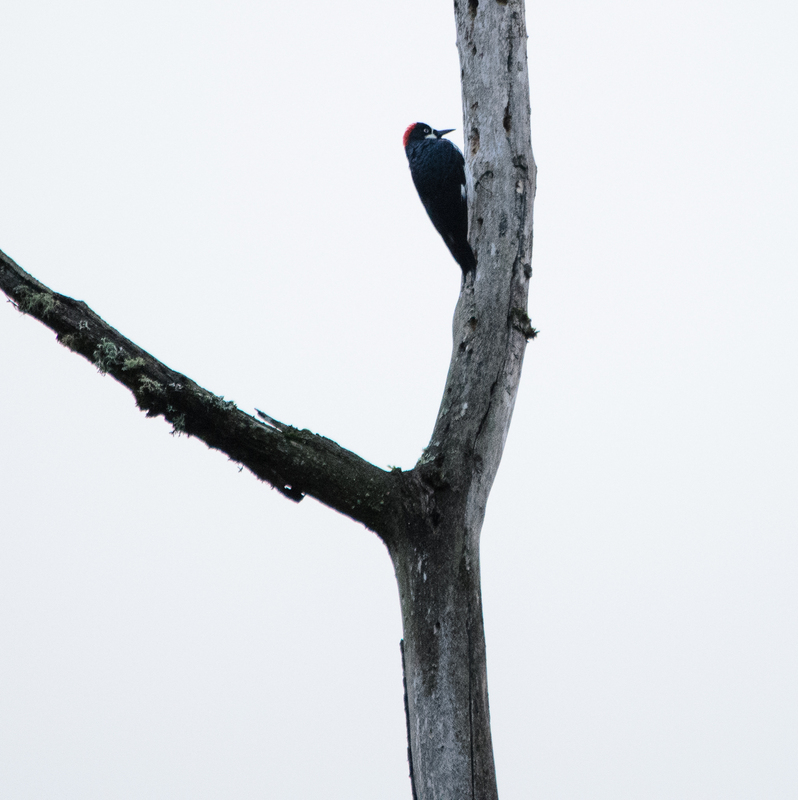 You can see more pictures below and on my Flickr feed from this birding outing. Dawson Creek is located behind the Hillsboro Public Library in Hillsboro, Oregon. I was unable to locate any sort of official site for the park (although there is a Facebook auto-generated page), but if you would like more information feel free to reach out and I will share what I know.